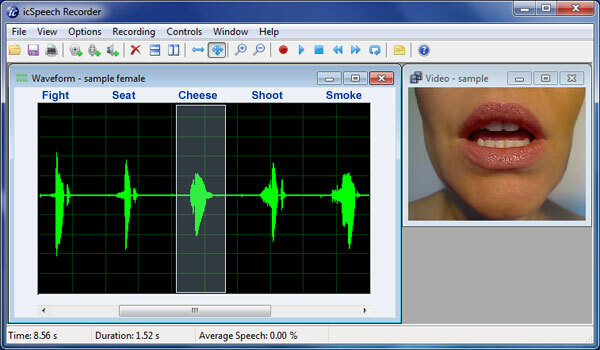 icSpeech Recorder has been designed specifically for use in speech and language applications. Key Features: - Records audio and video. - Multichannel waveform display featuring speech, voicing and pitch. - Supports picture and word voice prompts. - Annotates recording for quick identification of speech segments. - Easy playback of highlighted speech segments. - Measures speech, voicing, pitch and timing information. - Attaches descriptive notes to recordings. - Contains an extensive voice prompt image library. Playing Recordings With icSpeech Recorder you can easily listen to all or part of the recording. To listen to part of the recording, simply position a cursor over the speech segment of interest and press Play. Making Measurements The waveform display lets you perform precise measurements on the recorded speech data. Measurements are performed by positioning cursors over areas of interest. The following parameters are available: - Speech intensity or loudness - Voice intensity - Pitch - Timing information - Video frame at cursor position Voice Prompts Voice prompts are pictures, words or phrases that appear at set intervals during recording. In addition to prompting the speaker, voice prompts are used to annotate the recorded data, making it easier to identify speech segments of interest. Voice Prompt Editor With the voice prompt editor you can easily create customised voice prompts. icSpeech Recorder is shipped with a selection of prompt lists and an extensive image library. You can also extend the library with your own images. Supported file formats include: - BMP (bitmap) - JPEG - GIF Attaching Notes You can also create descriptive notes and attach them to your recordings. icSpeech Recorder uses the standard Windows Media file format so you can easily share your recordings with others. This site does not contain serial number, crack, keygen icSpeech Recorder serial number : serial number is the simplest type of crack. A serial number(cdkey,product key,etc) is register the program as you may already know. a crack or keygen may contain harmful software. If you cannot find the exact version you want, just give it a try. for more information read .nfo/.txt/.diz file include in zipped file.